Product #3114 | SKU IP-IRIG-MIC-IN | 0.0 (no ratings yet) Thanks for your rating! iRig Mic also comes* with VocaLive free, IK’s new real time effects processor suite for the singer and vocalist, and AmpliTube free for guitar players and songwriters and the soon to be released iRig Recorder, an IK app for quick audio recording and processing. 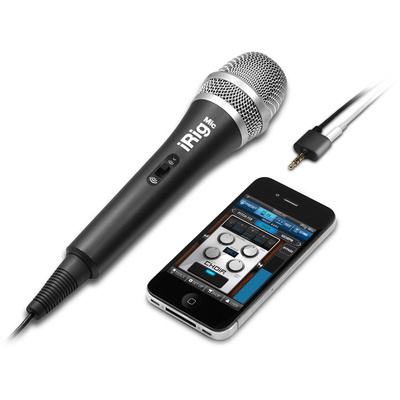 iRig Mic also works with a wide variety of other vocal and audio processing apps for the iOS platform. For singers and vocalists, the new VocaLive free app included* with iRig Mic offers for the first time a mobile suite of real-time effects dedicated to live vocal processing. Vocalists can add effects like choir harmonizer, pitch correction, vocal doubler, de-esser and more, together with advanced sing-along and recording features. The included* AmpliTube free app is the perfect companion for songwriters and features real-time guitar and bass effects, recording and mastering capabilities. The included* iRig Recorder is the new IK app for quick audio recording and processing so easy to operate that can be used by everybody, including non musicians.